Not long ago, we ran a post describing how business users can learn to become data scientists. No, we didn’t resort to spells or incantations. Instead, we described tools, capabilities and best practices that help analysis-minded business users get insight directly from their data. In this seven-part series, we’re devoting a post to each of the six enablers mentioned in our earlier post. First up: the most advanced self-service capabilities business users can perform on leading Big Data analytics platforms. Here’s a summary of advanced capabilities and why TIBCO Spotfire, Tableau Desktop and Hortonworks can help you perform. It’s a compilation: no single product has all the bells and whistles described here. But it can give you an idea of what you might accomplish at each stage of the analysis process. Big Data analytics platforms take the time and worry out of finding and selecting data for visualization and analysis. Easy access to data. There’s no time wasted discovering and selecting the data you need. All three platforms use centralized data repositories to avoid information silos and streamline data processing. And, Tableau Desktop lets you choose how to work with data–connect to live databases or bring your data into its in-memory analytical engine. Data mash-up functionality. Spotfire Desktop compiles different information formats from multiple sources. You can combine structured and unstructured data, private information such as spreadsheets or databases and corporate information stored onsite or in the cloud. Result: You’ll be able to insert or swap out data sets into a unified, visually interactive analytical interface. No coding or scripting required. Using the Tableau Desktop and TIBCO Spotfire data analysis platforms requires no programming skills. You select the data type and sources you want to examine in a drag-and-drop operation. Platform software does the rest. The emphasis here is on sophisticated, high-speed analysis. Analyze very large data sets. The Hortonworks platform is especially useful in high-volume data analysis for financial services, natural science research and other high-volume applications. By using RAM and of all the memory on your computer, Tableau in-memory technology enables you to process very large data sets. Go fast, faster, fastest. If blinding-fast analysis is your top priority, Hive on Tez is where you need to start. Tableau has been able to connect to several Hadoop tools. By creating live connections between Tableau Server and the Hive on Tez , you can query terabytes of data in billions of rows. So there’s no noticeable slowdown during question-and-answer analysis sessions. Highlight and filter data dynamically to show relationships. The word “play” might not be quite right, but theses platforms do encourage you to try out different ideas and assumptions. Especially with the Spotfire and Hortonworks platforms, you get results quickly enough that making an off-the-wall query might provide unexpected insight with only a modest time investment. Wide variety of descriptive and predictive analytics. Make one-click forecasts, build box plots and view statistical summaries of your data. The Spotfire Desktop predictive analytic engine enables you to run trend analyses, regressions and correlations, and perform queries without writing code. And when location data matters, just double-click geographic fields to put data on a map. 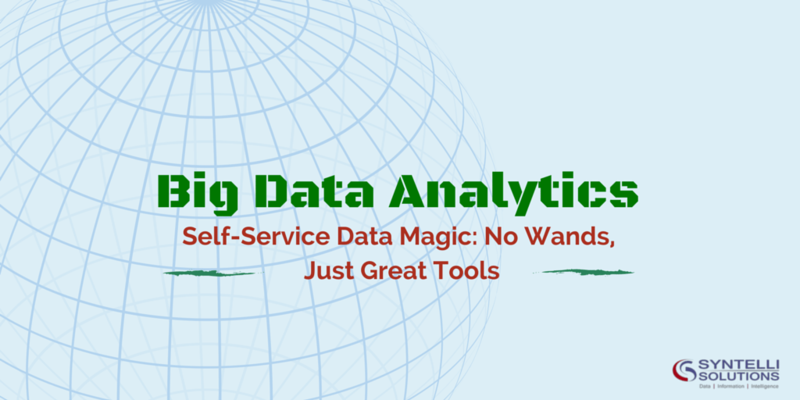 Next Time: We continue our review of data science magic by reviewing how business users can visualize and share data and insights without earning an advanced degree. Interested in exploring Spotfire on your own? Try the TIBCO Spotfire free trial! Or contact a Syntelli Data Scientist today!